I am continually amazed at my friends and professional colleagues (you know who you are) that have successfully found that balance between family, work, and genealogy, and yet still find enough time to write. That is something I have struggled mightily with these past few months, evidenced by my lapse in blog posts. Finding that “write” time has not been very easy. I won’t make any excuses, but I have challenged myself to be more vigilant with my writing, not only to stay engaged with my family’s past, but also to focus my research in a way that keeps me moving forward. My recent trip to Pittsburgh offered me the motivation to start writing again. Originally constructed as a quick trip to see the Bears-Steelers game, my trek to the Steel City quickly expanded into a weekend chock full of fun and family history. With my mother’s side of the family having lived in the Pittsburgh area for many years, finding something to research while I was in town was not a problem. As the trip drew closer, I included my daughters in both my research planning and the genealogy itinerary itself. So in between breakfast at the hotel (conveniently located across the street from PNC Park, home of the Pirates) and lunch at Primanti Brothers, we visited the Historical Society of Mount Lebanon, and then trekked – in the pouring rain – through Mount Lebanon Cemetery and St. John’s Cemetery. The girls were good sports about it; indeed, my oldest daughter has a genuine affection for history and asks good questions about the family and how the names all fit together. My budding genealogist! St. John’s Cemetery, located in Millvale just a few miles northeast of Pittsburgh, was a definite highlight. I knew from previous research that Joseph Vero, his wife Phoebe, and their daughter Elizabeth, were all buried there. A cemetery transcription I’d found identified a fair number of headstones, yet not an overwhelming number. Using Google Maps, I was able to zoom in on the cemetery, which helped me realize that I could probably walk the cemetery fairly quickly to find the Vero headstones. With the eager assistance of my assistants/daughters, it would only take a few minutes. 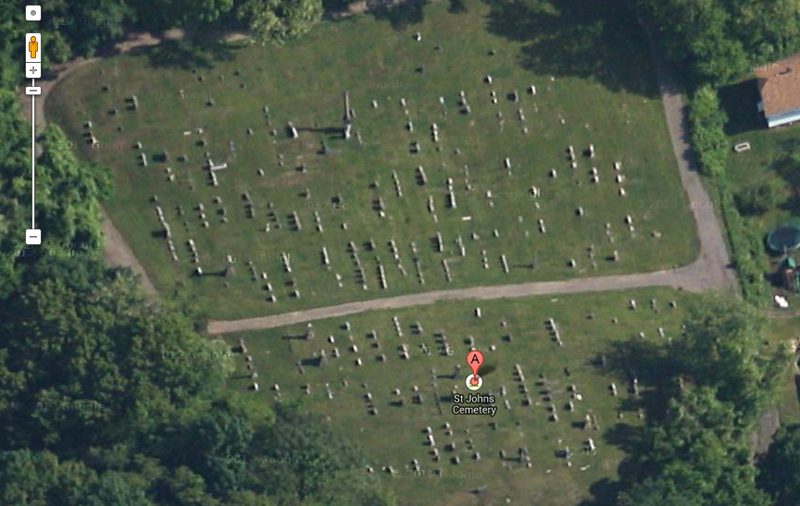 Here is a screenshot of the zoomed-in satellite view from Google Maps showing the cemetery. St. John’s Cemetery, Millvale (PA). Google is fantastic and can do many things, but what it can’t illustrate particularly well is altitude. What looks above like a short and easy access entrance road to the cemetery is actually a slightly overgrown, suspension rattling, pot-holed crawl up a near 45-degree incline. Adding to the fun, just two feet to the right of the road (obscured by trees on the lower right hand corner) is a severe drop down to the houses below. At the apex of the hill, near where the paths converge, the cemetery itself is chained off, which a driver cannot see from the main road far below. And did I mention it was pouring rain? After disembarking from the car, we popped open our umbrellas, split into teams, and scoured the cemetery looking for the Vero headstones. Success! Here is Joseph’s headstone. 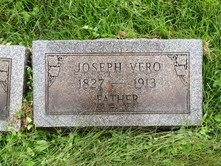 Joseph Vero, St. John’s Cemetery, Millvale (PA). My g-g-g grandfather, Joseph Vero was born in England in 1827 and immigrated to the United States in the 1860’s. After a brief stay in Jefferson County, Ohio, he and his wife Phoebe and their growing family moved to Millvale in Allegheny County, Pennsylvania in the late 1870’s. After a harrowing reverse drive back to the main road, the genealogy component of our rain-soaked adventure in Pittsburgh concluded. Baseball, football, and Mount Washington awaited, a fantastic weekend in a fantastic city.